Handmade Ravioli with meat sauce, following a typical Piemonte recipe. 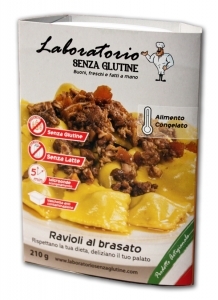 These Ravioli are gluten free, milk free and preservative free. The practical bowl can be warmed in a couple of minutes in the microwave, without opening, so you can avoid any contamination risk. Pork sausage 23%, rice flour, egg, beef 8,7%, potato starch, rice starch, onion, carrot, corn starch, extra virgin olive oil, sangiovese (red wine), tomato, guar flour (E412).